School will be closed from Friday April 19th to Friday April 26th for Spring Break Recess. School will reopen Monday April 29th. 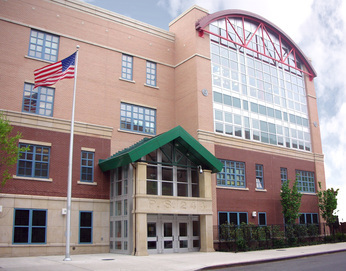 The mission of The Active Learning Elementary School (TALES), a PreK to 3 school, is to foster academic excellence in a safe and caring learning environment, through a partnership of family, staff, and community. TALES strives to meet children's academic, physical, and social needs with the belief that educating the whole child allows for learning at optimal levels. With our rigorous academic curriculum, emphasis on social development, and a focus on health and nutrition, students will receive the foundations necessary to excel academically as well as lead healthy, productive lives. TALES students will stimulate their minds, nourish their bodies, and develop character. The School Leadership Team (SLT) meeting dates are below and will be held in the library at 4PM. Recognized by the Alliance for a Healthier Generation as one of the healthiest schools in the nation. First public school in the nation to serve a healthy plant-based breakfast and lunch every day, with the help and support of the Coalition for Healthy School Food. Recipient of the 2013 Golden Carrot Award from the Physicians Committee for Responsible Medicine for serving healthy breakfast and lunch. Provide students with comprehensive fitness and nutrition education in addition to their regular Phys. Ed. classes. Students participate in healthy food-tastings at least once a month. Stellar student attendance rate, well-above city average. 100% passing rate in 2011 State ELA and Math Exams. 86% in ELA and 92% in Math scoring 3s and 4s in the 2012 State exams. 86% in ELA and 88% in Math scoring 3s and 4s in the updated 2013 Common Core State exams. Ranked 11th in New York State based on test scores. Secured over $32,000 in Grant funding for School Wellness and Garden. Local, national, and international media coverage of P.S. 244. U.S. Rep. Grace Meng (D-Queens) announced today that the United States Department of Education has designated P.S. 244 in Flushing as a Blue Ribbon School. P.S. 244, known as The Active Learning Elementary School (TALES), was awarded the designation this morning by U.S. Secretary of Education Arne Duncan. The National Blue Ribbon School program honors public and private elementary, middle, and high schools where students either achieve very high learning standards or make notable improvements in closing the achievement gap. P.S. 244 is a PreK to 3 school that features a rigorous academic curriculum with an emphasis on social development, and a focus on health and nutrition. It is among only 335 public and private schools from across the country that received the Blue Ribbon designation today. On November 9 and 10, representatives from each school – including P.S. 244 – will be formally recognized at a special ceremony in Washington, D.C. At the event, each school will be presented with an award plaque and a flag as symbols of their accomplishments. P.S. 244 is located at 137-20 Franklin Avenue. Statement on Accessibility: We are working to make this website easier to access for people with disabilities, and will follow the Web Content Accessibility Guidelines 2.0. If you need assistance with a particular page or document on our current site, please contact Lalita Kovvuri at lkovvuri244@gmail.com to request assistance.